Old bikes are unquestionably cool. But if you buy one, you’re on the fast track to becoming a self-made mechanic, specializing in that specific brand and model. 2LOUD is run by ‘Max’ Ma Yicheng and based in Taipei, Taiwan, where customizing motorcycles is tricky, thanks to strict regulations. 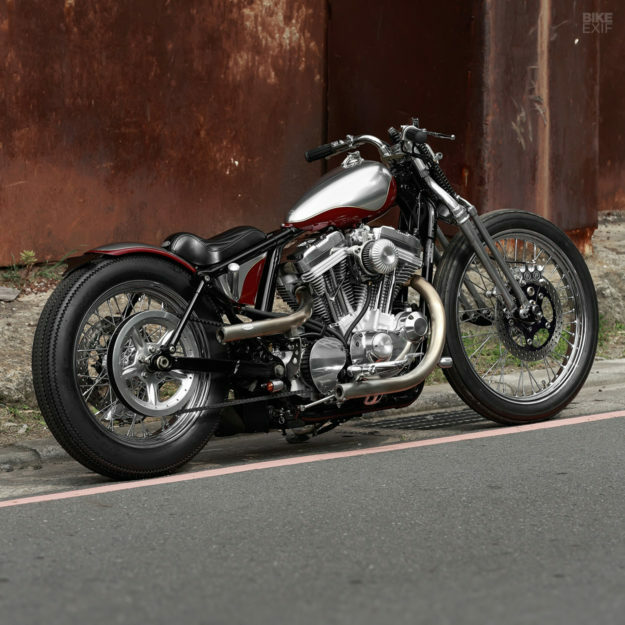 When a customer booked in this 2009-model Sportster XL883 Custom, Max set himself a challenge. Max’s changes are pretty extensive. 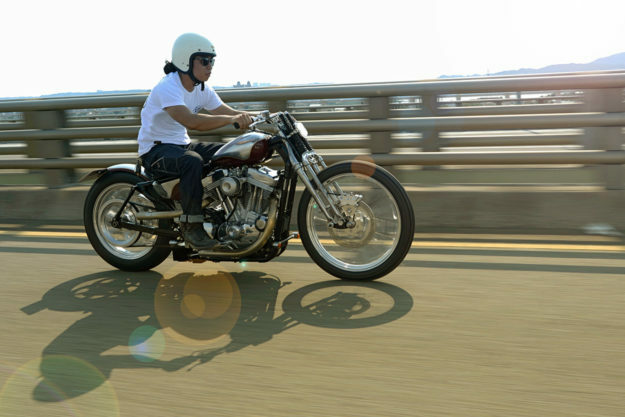 At the heart of the Sporty, he ripped out the fuel injection and installed a Mikuni HSR42 carb—resulting in more power and less wiring. (It’s matched up to a hand-made air filter system.) 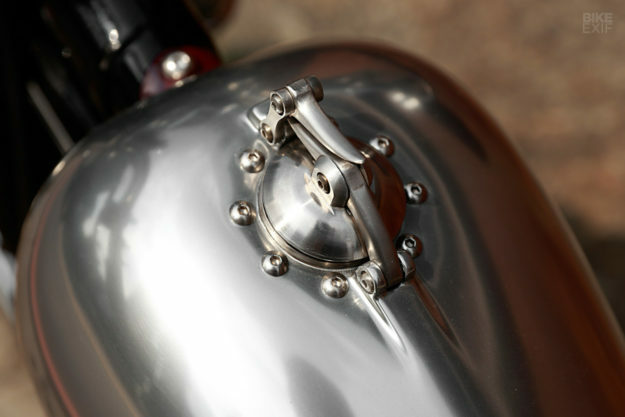 The twin exhausts are custom too, and include proper packing and baffling to keep noise levels reasonable. The real vintage hit comes from the reworked chassis and bodywork. 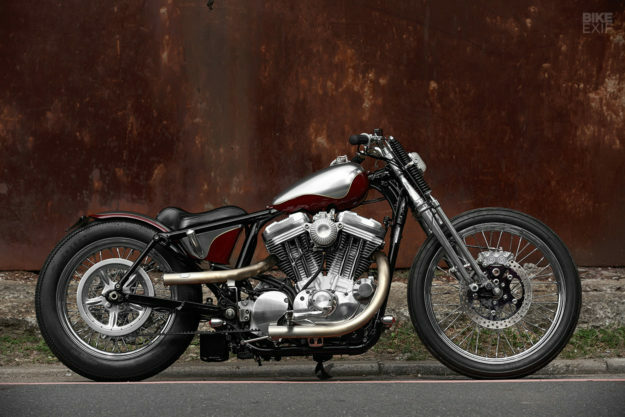 Gone is the Sporty’s stock suspension—replaced by a pair of rigid struts in the rear, and classic Harley springer forks up front. The rear part of the frame’s been reworked too, to even out the lines and keep things tidy. 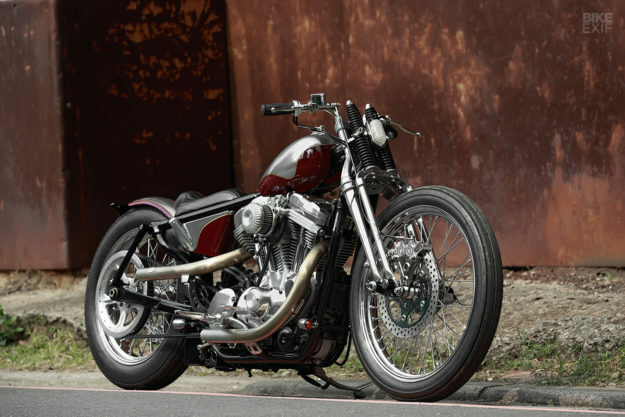 Max has kept the XL883 Sportster’s stock 21” front wheel, but he’s swapped the 16” rear for a skinnier 18” number. The front tire’s a Firestone, and the rear’s a Japanese-made Adlert (a Firestone Deluxe Champion lookalike). For added stopping power, Max has installed Performance Machine four-piston calipers along with floating rotors. 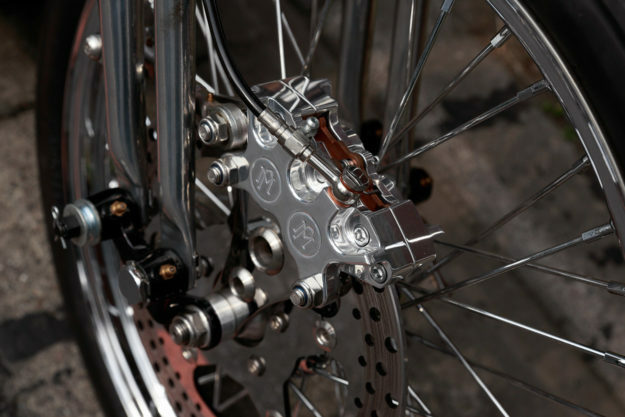 The calipers sit on gorgeous hand-crafted mounting brackets, creating a system that looks as good as it works. 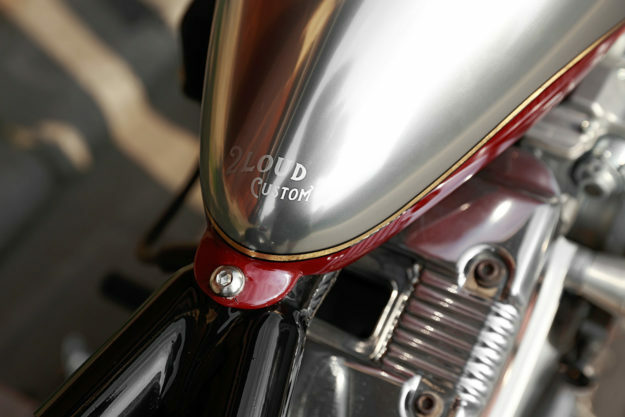 Everything ends neatly in a custom-made black leather seat, and a bobbed rear fender. The bike has a tail light and turn signals—though you might miss them at first glance—and even a license plate bracket. 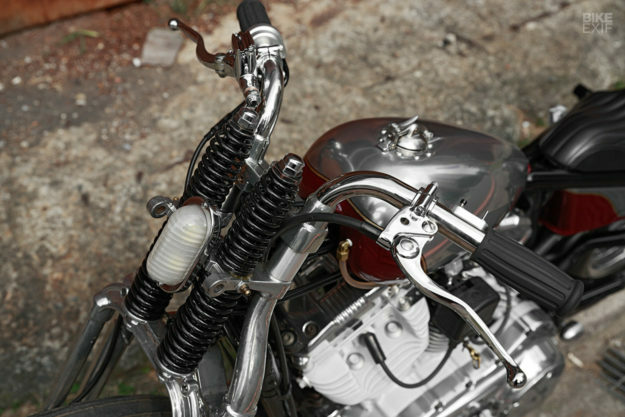 The cockpit’s equally slick, with direct-mount bars, minimal classic switches and a hand-made headlight. Yes, you read right—Max sourced vintage glass on eBay, then built a housing and added LED internals. Max is fast developing a reputation for leaving no stone unturned, and it’s being propped up by builds like this. He’s even re-shaped and polished some of the engine and drive covers. 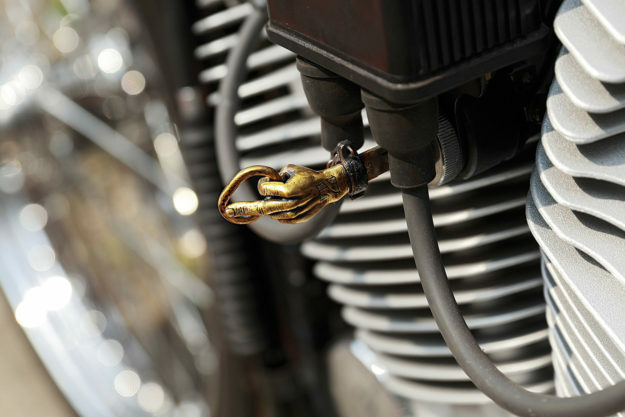 Keep digging, and you’ll notice details like the little lever on the end of the front axle, or the cheeky choke pull on the carb. Then there’s the overall finish—dominated by raw and polished metal, and finished off with a luscious two-tone paint scheme. A pinstripe runs through the build to emphasize the bike’s new flow, but it’s more than just a simple lick of paint. The stripe contains gold leaf, mixed with a metalflake paint finish. As far as outright performance goes, there are slightly better options than a rigid rear end and vintage tires. 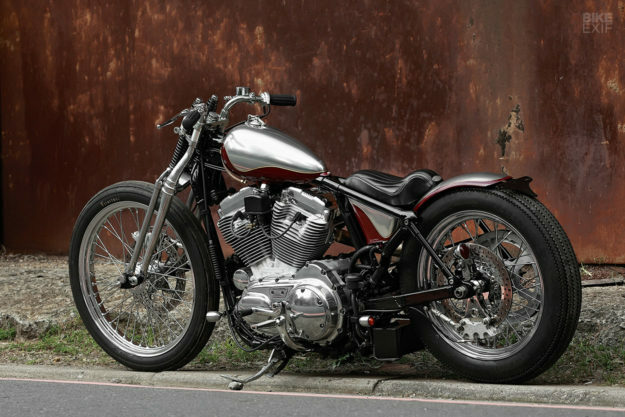 But this retro Harley bobber has upgraded brakes, a little more oomph and—most importantly—will start every time. It’s a ‘modern classic’ and it makes a ton of sense. Now consider that Max’s last bike was released just three weeks ago, and that was a banger too. I’d say he’s officially on a roll, wouldn’t you?